As Michelle Chen’s time grew close to expiration last Friday afternoon, her opponent was a few yards away — Alice Dong’s back was turned to the board as she watched a chess game several tables over, one of the few other games still continuing in the final round of the Susan Polgar Girls Invitational chess tournament. A draw would secure the championship for Chen. Dong needed a win. Halfway through their game, when the Webster University auditorium was still filled with 48 girls spread out over 24 tables, a draw seemed almost inevitable. In the lobby of the theater, a handful of parents had been casually watching a live stream of the game among chit-chat and small talk. 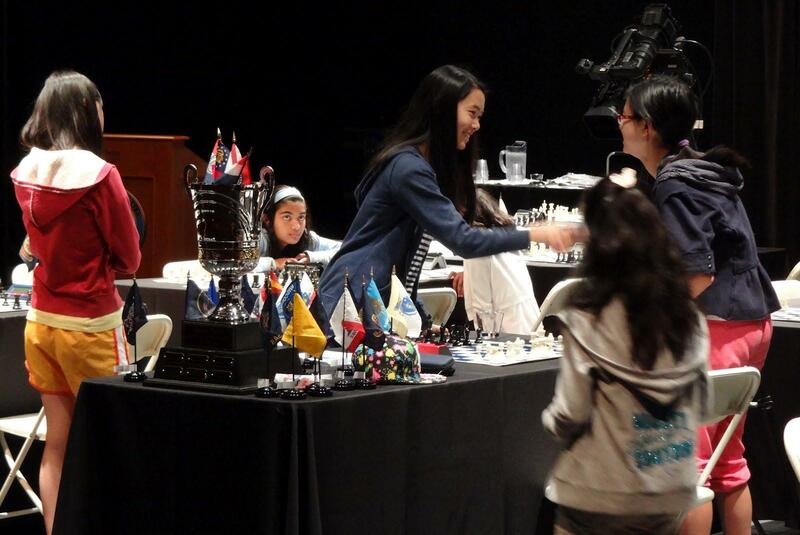 Girls get a chance to discover many others who love chess at the Susan Polgar Girls Invitational chess tournament. But a series of suffocating attacks by Dong and a questionable retreat by Chen had upset the balance. With less than 10 minutes left on Chen’s clock, Dong had control over the board — and a likely shot at the first-place finish. The lobby television was surrounded by parents, siblings and three of Webster University’s top-ranked collegiate chess players. For the past 20 minutes, all of the talk had centered around the championship game. “She had a chance,” and “She took a C5?” and “Should’ve been a draw! But no — now white wins,” were tossed around the conversation, accompanied by numbers and letters and wry chess humor. One father drew imaginary lines on the screen as others looked on, arms crossed and heads cocked back. Three members of the Webster team — all top-ranked Grandmasters — fielded casual questions from the crowd. The ninth annual Susan Polgar Girls’ Invitational was the first chess tournament held at Webster University since Polgar moved her powerhouse collegiate team and chess advocacy organization — the Susan Polgar Institute for Chess Excellence (SPICE) — from Texas Tech University in Lubbock, to Webster University in suburban St. Louis. Forty-eight girls, ranging from 6 to 19, competed over six rounds of play for the top-two spots and a $13,000-a-year scholarship award for attendance at Webster University. “This event has two purposes: One is to give opportunities to the top girls overall, and to motivate them,” Polgar said. The educational benefits of chess initially drew 14-year-old Annastasia Wyzywany, and her mother, Jill Wyzywany, to the game. When Jill Wyzywany first heard about chess scholarships, her interest in chess grew. The Polgar tournament inspires competition and friendship. Scholarships are a relatively new phenomenon in collegiate chess. They first gained traction in the 1990s at a handful of schools. Today, the number of schools offering scholarships is still small, yet two in the St. Louis area — Webster and Lindenwood universities — will roll out scholarship-backed teams this fall. Polgar hopes that, four years from now, Dong, Chen and Wyzywany will follow through on their scholarship offers at Webster University. As with any sport, the joy of competition lies at the core of tournaments. With Polgar’s tournament, tradition also plays a role, adding an almost summer camp element to the tournament. For Annastasia and her sister, 13-year-old Amelia Wyzywany, there were two highlights to every year — “Christmas and Polgar,” Wyzywany said. “Once Christmas rolls around, they start counting down the days and the months to Polgar,” their mother said. Annastasia and Amelia are still often the only girls at tournaments in the Shreveport, La., area. When they began to learn chess, they were part of a chess club at a local bookstore where they were the only girls and the youngest players in attendance. For these chess players, the tournament is a time to connect with other players who may lack a network of similar players in their hometowns. “They’re obsessed with the travel and meeting people they know from all over the country, and sometimes international players as well,” Dr. Martha Underwood said, referring to her daughter. Even at the tournament, a sense of communality sometimes trumped competition. Many of the competitiors had attended the Polgar tournament together for many years, forging friendships that went beyond the lines of victory and defeat, sometimes sidestepping them all together. “I just wanted to get done with the game,”Aiya Underwood said, discussing her final game draw with friend Rebecca Deland. Back in the theater, Ballwin-native Margaret Hua, who entered with the second highest seed in the tournament, was standing behind Chen, turned away from her own board, surveying the topsy-turvy championship game. Alice Dong accepts congratulations on her victory. Finally, with little time remaining, Chen resigned. She extended her hand over the chess board for a customary handshake with Dong, now the 1st place finisher of the tournament — Chen would finish second. After resetting the board, the girls stood up and hugged. Hua, still in the midst of her game, turned to the table, hugging and high fiving Dong, hugging and offering a conciliatory shrug to Chen. Small whispers, and then giggles, broke the silence of the theater. The girls talked quietly together, before Hua returned to her board — she would win the game and finish sixth overall — and Chen and Dong packed their notebooks to leave. “Those girls are all best friends,” Paul Truong, Polgar’s husband, said. Out in the lobby, the buzzing crowd began to trickle out for lunch prior to the closing ceremonies. "Every time my son and my daughter would meet a relative, it's 'How's the chess going, Zach?'" Underwood said. "Aiya may have won the tournament in the same section as Zach. ... For some reason we're programmed to think that the boys are the chess players. We're working on that."